Bio: Born in 1934 in Brooklyn, New York, Sigmund Abeles grew up in Myrtle Beach, South Carolina. As a young man, he spent countless days sketching and drawing the sculpture in nearby Brookgreen Gardens before leaving to attend the University of South Carolina in Columbia. Following graduation in 1955 from USC with a B.A. in Fine Arts, Abeles studied at the Art Students League of New York in NYC, the Skowhegan School in Maine and received a Masters in Fine Arts from Columbia University in 1957. Coastal Carolina University presented Abeles with an honorary Doctorate in Fine Arts. He was Resident Artist, Wellesley College, Wellesley, MA, 1964 - 1969; Associate Professor, Boston University, School of Fine Arts, 1969 - 1970; and Full Professor with tenure, University of New Hampshire, Durham, 1970 - 1987. Elected Professor Emeritus at the University of New Hampshire, in 1987, after 27 years of teaching, he works full-time in his NYC and upstate New York studio. Recipient of numerous grants and awards, and a National Academician since 1990, Abeles work is in the collections of the Boston Museum of Fine Arts, the Chicago Art Institute, the Metropolitan Museum of Art, the Museum of Modern Art, NYC, the Philadelphia Museum and the Whitney Museum of American Art, among many others. The Pastel Society of America made him their Hall of Fame Honoree for 2004 and he was awarded their Degas Pastel Society Award in 2006. He is represented by The Old Print Shop, NYC, Hampton III Gallery, Greenville, SC and Cherly Newby Fine Arts, Pawley's Island, S.C.
Elizabeth Exler conducted an informative interview with the artist in the Pastel Journal, Issue No. 48, February 2007, in which Abeles stated that pastel was his favourite medium. Medium: He works in pastels, oils, the graphic media, and sculpture. Subjects: Abeles is an artist whose work deals with the expressive and psychological aspects of the human figure (and animals); an art focused on the entire life cycle. Drawing informs all his work. Navigation: There will be much use of the back button on this website as the pages are not interlinked. However, the art is worth the effort. And there is a Return to Home Page link on most pages. Gallery: There is a list on the home page that embraces Horse Imagery (subgalleries: Pastels; Oils; Lithographs; Drawings; Sculpture; [Vitae is biographical in content]); Pastels (3 pages, 2 images each; more promised; Paintings (3 pages); Drawings (7 pages); Sculpture (24 images that may be clicked on to enlarge); Prints (7 pages of lithographs). Image View: Each gallery is presented variously. The horse pastels are in a viewer with a mouse-over facility along the bottom that presents a small thumbnail of the related image – click to view in the viewer. The Pastels gallery consists of relatively large images that seem to be “clickable” but lead to a “page not found” result. 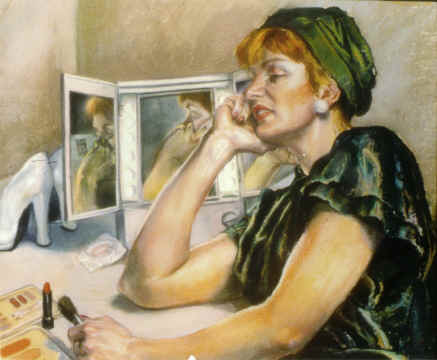 Actor with her make-up mirror is 22 x 28 ins, 437 x 360, 17.8 KB.